KitMonsters – Saint Agnes. The music makers’ guide to making music. Saint Agnes are an explosive fuzz-laden rock n roll band with a wild west streak - with the emphasis on wild. 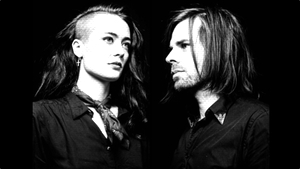 Kitty from the band Lola Colt and Jon from The Lost Souls Club have joined forces, sharing a love of similar music. Their live performances are passionate, compelling and feature everything from vintage guitar to harmonica and keys. Debut single Old Bone Rattle boasts a riff that kicks you in the gut with a cowboy boot. 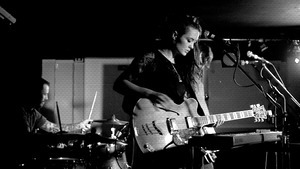 Saint Agnes have just released their debut single, Old Bone Rattle, after a handful of thrilling gigs in London. It is clear they are having fun, and Jon says the duo embrace their influences and refuse to be bound by genres. We realised we were a bit bored with the painfully self conscious way a lot of bands produced their music in London, refusing to have flair and always playing it safe to be ‘cool’. Well we like guitar solos and Deep Purple keys as well as the more modern shoegaze and psych scene so went ahead and made the music we wanted to hear. So far the response has been amazing! 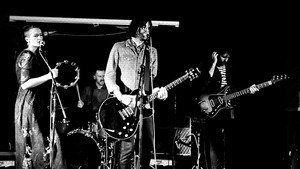 The gigs are wild and exciting - intense, fast and furious, with Kitty and Jon playing everything from guitars to harmonica, drums and keys, along with a guest bass player and a drummer. While their influences could have rendered them a bit introspective, the reality is anything but. Kitty says it’s all about the live show. The most important thing without a doubt is to connect with the audience. To excite them and ensure they leave on a high. For me playing live is where I feel the happiest. It’s what I get up in the morning for. I think it’s really important to rehearse a lot, to make sure you’re the very best you can be musically, and also to enjoy yourself. No matter what the genre, if I see someone onstage giving it their all in a genuine way, so its really obvious that they are loving what they’re playing and having the best time, then I’ll love it too. You can’t fake that. An audience can tell a mile off if you’re fully into what you’re doing so the day I stop loving it is the day I’ll stop playing. Jon has the same aim too. Working well, and aggressive shred-offs! The sparks fly on stage - there is amazing presence, and interaction between the two of them, and Kitty tells us there is a good reason for that! Jon is my best friend in the world and I feel completely at ease with him on and off stage. This is a curse and a blessing. It means we have no qualms about having blazing rows which do sometimes get carried on stage (it results in aggressive shred-offs). It also means, though, that we can musically express ourselves in the most productive way. Writing music is, of course, extremely personal and it can be scary presenting your ideas to a band. Being so close means you can write without insecurity. I think as well that we work together well on stage because we love what we’re playing and it’s special to share the moment with someone who you’ve worked hard with to make it happen. So how do they write their songs? Kitty say’s it’s a musical partnership. Usually one of us has a riff that we’ve come up with that we share with the other person, then the ideas just start flowing from there. We’re usually sat down with acoustics in one of our bedrooms when we have a spare evening with a bottle of wine. It really is a 50/50 partnership with each new song being a combination of our ideas, for example with ‘Old Bone Rattle’ Jon came up with the main riff, I wrote the melody line, we both worked on the words and then I had the idea of the ridiculously dramatic organ breakdown halfway through. It’s very exciting having a second mind to write with and push you out of your usual song writing style. We’re also both very open to having our ideas re worked or developed so it’s quite a pain-free process. Though if one of has a real gut instinct about something we tend to go with it even if the other person disagrees. That ‘letting go’ can reap dividends says Jon. Saint Agnes mix up high end and lo fi kit and seem to relish the challenge of working with limited resources. They say they have been recording their tracks quickly as an experiment to see what they can do with minimal computer gear. We’re not the world’s richest band so a lot of what we use is fairly budget, but we’ve spent quite a while honing it to what works well for our sound. 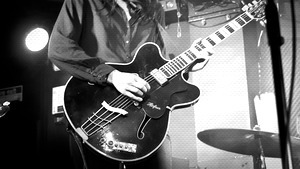 So 90% is cool lo-fi stuff then a few REALLY cool items like Kitty’s 1961 Hofner Verithin. We recorded in a tiny flat in East London so couldn’t mic an amp. We then ran various pedals through Guitar Rig to get our sounds. So it’s all the diamonds in the rough of cheaper stuff, some of it things we’d not expected would be so cool. Tell people you use a Zoom fuzz pedal and they tend to wince, but I own I think 10 different fuzzes and this one is just amazing! Saint Agnes have also recorded a cover of The Doors’ Roadhouse Blues, that is the B side of their new 7” single. Kitty is a compelling singer and amazing multi-instrumentalist - we’ve seen her play guitar, keys and all kinds of percussion on stage. I’m a bit of jack of all trades, master of none! 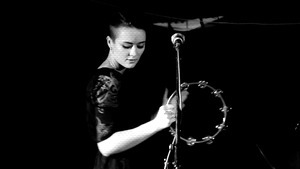 I started playing keys and percussion when I joined Lola Colt. They were looking for an organist/percussionist and I had the gall to apply for the job even though I had extremely rudimentary skills in both. Joining Lola Colt was a huge learning curve for me and the more I experimented with different percussion (bells, guiro, maracas etc) the more I’ve realised how incredibly versatile and interesting different percussive sounds can be and just how much they can add to a song. I’ve started to become annoyingly pedantic now about the kinds of wood and metals I use and have started a rather impressive tambourine arsenal!! My body’s also become harder and more durable as when I started out I would be covered in massive bruises all up and down my thighs and hips! I just don’t get the bruises and blisters anymore so I think I’ve evolved into a kind of percussive superwoman. 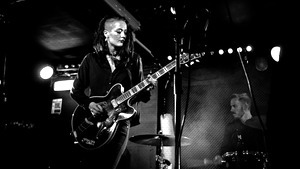 Kitty’s main guitar is a vintage Hofner Verithin. My Hofner Verithin is the best thing that’s ever happened to me. It’s a 1961, nearly all original (the machine heads were replaced) beauty of a guitar. It has that pure sixties, chimey, warm sound that just gives me goosebumps. I’d just got my student loan through and saw it on the internet and HAD to go and have a look. It was owned by the most incredible guy Bill, he’s a special effects genius and was the man behind Babe the pig! He’s also an avid Hofner collector but due, sadly, to a stroke he’s started selling off all of his guitars as he can’t play too much anymore. Jon very kindly drove me down to Brighton to pick the guitar up and we ended up having a lovely afternoon with Bill and his wife June having tea and cakes and talking about Bill’s amazing career. As to whether we both play the guitar I’d like to point out that Jon isn’t allowed anywhere near it: it’s my baby and he’s banned. Kitty has other guitars too such as a Guild Acoustic. My Guild was bought with another student loan instalment… It’s really lovely for the money. I used to use it much more as I used to do some solo shows, just guitar and vocals, but I still use it for writing. She gets her on stage growl from a Peavey tube amp. It’s a Peavey Classic 30 from 1991 that my Dad gave me. It’s just a 1x12 but really packs a punch. Kitty has the luxury of playing a vintage Vox Continental in Lola Colt and it’s a fascinating contrast to her Saint Agnes gear. The organ I use in Lola Colt actually belongs to Matt the guitarist and key song writer. It’s an original 1960s Vox Continental, it’s got that real swinging sixties organ vibe with its own unique set of quirks. It’s also extremely temperamental and doesn’t cope well with road knocks so we only use it for special shows. I also play a Nord Electro 4D which is much more roadworthy. It’s a wonderful piece of kit, the best Vox simulation around definitely but lacking, of course, those wonderful but sometimes painful, quirks of the Continental. At very special gigs I like to use both organs to mix it up and because it makes me look like Rick Wakeman which, in my eyes, is no bad thing. 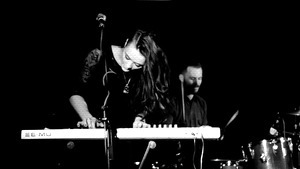 With Saint Agnes she has a pared-down set up and uses a MIDI keyboard rigged up to her iPhone. It’s become something of a talking point. It’s surprisingly brilliant! I use an ‘iRig’ and a three pound app called the ‘Pocket Organ’ (cue endless innuendo) with the MIDI keyboard (EMU X Board 61), and go through both the PA and a Fender solid state combo for some extra drive. You can get a real nice Vox-like sound from it. I’m going to start adding pedals to the chain too as I want to get a few more interesting rackets out of it. I used an MXR Phase 90 through the Nord and it sounded insane! The dream would be a Roland Space Echo for some really crazy noise but it’s a little out of my price range at the moment! (I just finished uni so no more loan instalments). Jon is very selective in finding the right guitar gear for his fuzz-laden sound, but isn’t dazzled by the most expensive or cool-seeming kit. My guitar is nothing that special, but it’s mine and I think that’s important, the best tools are the ones you don’t really notice you’re using. I’m so comfortable with it and it just feels right and I know how to get the best out of it. It’s an Epiphone Dot with different pickups. No idea exactly what they are as they were replaced before I bought it, but the neck humbucker has been replaced with a P-90 of some sort. I love the P-90 sound, it sounds so metallic and open to me, it feels like you can get more subtleties in your playing out of a guitar with P-90s. In fact I’m considering putting one in the bridge position too. The nut has been replaced as well as the original plastic one broke, its now something a bit fancier, some kind of bone/horn I believe, but I don’t think it makes any noticeable sonic difference, its just better at holding it’s tuning now which is the main thing. Jon has been working his way through fuzz pedals. I try not to get too bogged down in having ‘must have’ gear as I like to think I could pretty much re-create all the sounds I need with a fairly basic setup, but I will say that I have two fuzzes that I love. One is a Zoom UF-01 Ultra Fuzz. It’s the least cool fuzz ever in terms of gear nerd points, but it’s the only one I have used that cuts through live and doesn’t just turn to mush. When recording however I love the Woolly Mammoth clone I managed to get hold of, it’s great for the super fizzy lead guitar stuff like on Old Bone Rattle as well as the bass on the same song. Sadly it gets totally drowned out live, that’s where my trusty old Zoom comes in. It turns out that the Mammoth clone was made by one of Jon’s friends and when Saint Agnes have a bass player for their live shows, they play using it. Jon says that he and Kitty have a big collection of stompboxes between them. 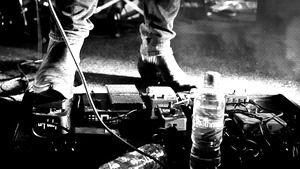 One of the pedals they use a lot is the Digitech Bad Monkey, with its shades of the Ibanez Tubescreamer. It was especially useful for recording. We used it when we needed a different tone to the RAT to help push the mid range so the guitars didn’t clash. 90% of the guitars had a RAT on them. Often used really subtly as I just love the cut and jangle it adds. It feels properly dirty without becoming impossible to hear the riff. I’d love an Octavia pedal, something to really get Hendrixy with. Jon and Kitty are big fans of Native Instruments Guitar Rig. We used this as our virtual guitar amp (most of it is the Fender Twin setting or occasionally an AC30 setting) as we recorded in a tiny flat in East London so couldn’t mic an amp. We then ran various pedals through it to get our sounds. We also used Guitar Rig for the bass in the same way and in the mix put it on everything. Keys, vocals and harmonica. Guitar Rig is amazing. 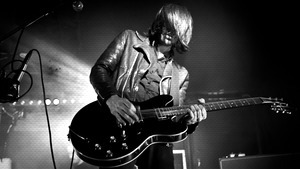 When it comes to gigs, Jon uses a very real Vox AC30 CC2 for his ferocious guitar sound. I use a Vox AC30 CC2. I was just using it live, but recently we recorded some demos with it and it sounded great. It’s totally stock, I’ve not done anything to it as people often change the valves and swap the speakers in these. Maybe it’d make it better? I don’t know, I like it as it is. I use both the channels on it at the same time with it fairly driven and the reverb up on full. For cleaner sounds I turn down my guitar volume knob and for more distortion I use the zoom ultra-fuzz of an EHX lpb-1 if I need something that’s just louder. The only downside is it weighs a tonne! Saint Agnes used Cubase Elements 6 for recording, “the simplest version”. When it came to mixing their tracks, there was one rule only! Every plug in we used was free (not pirated, genuinely free, Guitar Rig came free with our soundcard). Blockfish compressor got used a lot and a whole load of plug-ins from Variety Of Sound. I’m a fan of limitations in mixing other wise things get ridiculous and the free stuff out there now is amazing. There are lots of cool expensive things too, but we recorded really quickly as an experiment to see what we could do with minimal computer gear. Kitty and Jon have a few microphones, but there’s one Jon’s still after. Right now if someone bought me a Shure Green Bullet mic for my harmonica I’d not complain, nothing beats that raunchy kind of sound. One Shure mic they already have though is the SM7B - which was their go-to mic for recording the new tracks. We used it on all the vocals, acoustic guitars and tambourine. A Sennheiser e840 was used for double tracking Kitty’s vocals and as a second mic on the acoustic guitars. Jon’s inspired by classic rock artists, and people who break so-called studio rules. I’ve always loved the way Trent Reznor works in the studio, never sticking to traditional sounds and despite the music being modern he’ll often have a really trashy drumkit sound or no bass on a track; things which are anathema in most modern productions where everything is about the pristine top end and kick drums that knock you over. The emotional intensity of NIN has always resonated with me too. Outside of that it’s the classic rock you’d expect, Hendrix, The Who, The Doors etc. Their music and legacy has survived for a reason, they were simply innovators who were better than the rest. I find that inspiring. Oh and Pantera, I grew up on metal and it must have rubbed off on me somewhere even if it’s just my refusal to smile in promo shots.